Since it was first published in 1972, Learning from Las Vegas has become a classic in the theory of architecture and one of the most influential architecture texts of the twentieth century. The treatise by Robert Venturi, Denise Scott Brown, and Steven Izenour (1940–2001) enjoys a reputation as a signal work of postmodernism in architecture and urban planning. Yet none of the book’s editions have ever featured high-quality color images of the field research the authors conducted to illustrate their argument. 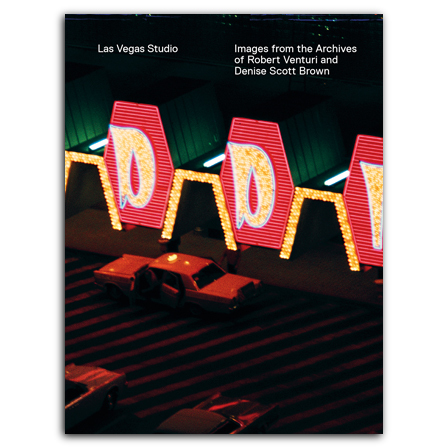 Las Vegas Studio is the first book ever to present these significant photographs in large, full-color reproductions. Now available in paperback, this unique book features these iconic images and film stills, alongside essays by Swiss scholars Stanislaus von Moos and Martino Stierli that explore how the pictures contemplate the phenomenon of the modern city. Also included is a discussion by curator and critic Hans Ulrich Obrist with Dutch architect Rem Koolhaas and Swiss artist Peter Fischli that speaks to the strong and lasting influence these images still have on contemporary art and movies. A unique opportunity to experience the full intent and import of the Learning from Las Vegas project, Las Vegas Studio continues to appeal to architects, architectural historians, and scholars alike. , born 1952, is an artist. He was educated at the Academies of Fine Arts in Urbino and Bologna. 1979–2012 he formed together with David Weiss (1946–2012) the internationally acclaimed artist duo Fischli/Weiss. , born 1944, is an architect and co-founder of Rotterdam-based firm Office for Metropolitan Architecture (OMA). He is also a Professor in Practice of Architecture and Urban Design at Harvard Graduate School of Design. , born 1940, has been a professor of art history at University of Zürich 1983–2005 and a visiting professor of art history at Yale School of Architecture since 2010. He has published widely on architectural history, including monographs on Le Corbusier and Robert Venturi. , born 1968, is Artistic Director of London's Serpentine Gallery and a freelance curator. He has before been a curator at the Musée d'Art Moderne de la Ville de Paris and the Museum in Progress, Vienna. , born 1963, studied art history and is director of Museum im Bellpark in Kriens, near Lucerne, Switzerland.